It's already the Fourth of July, and if you haven't had a watermelon yet, then this is the week to start. I mean, really, a Fourth of July without watermelon is like a birthday without a cake. I love eating plain watermelon in its simple, sweet glory, but it’s also fantastic in savory dishes. The key is to pair it with contrasting flavors such as salty cheeses, bitter salad greens, acidic vinegars, or smoky grilled meats to balance the watermelon's sweetness. In fact, why not try something different for this Fourth of July -- like my new Grilled Steak Tacos with Watermelon-Mango-Jicama Salsa? For this dish, char-grilled steak is topped with a sweet and tangy watermelon salsa and crumby Mexican cheese. This salsa is so refreshing that you may want to make extra so your guests can dunk their tortilla chips in it while they're waiting for the steak to grill. Then, while they're munching, you can show off your watermelon knowledge: the average American eats 16 pounds of watermelon a year! Course, I have over 20 pounds a year myself, so there a few people out there eating less than 16 pounds to average things out. Heat the grill to high. Season both sides of the steak with salt and pepper. Place steaks on the grill, close cover, and cook until charred, about 5 minutes. Closing the cover will help create a charred exterior and a softer, juicer interior. Turn steaks over, lower the heat to medium-high, and cook another 3-4 minutes for a medium-rare steak or 5-6 minutes for a medium steak. Allow to rest for 5 minutes before slicing. Heat tortillas on the top rack of grill for about for 1 minute per side or until warmed through. 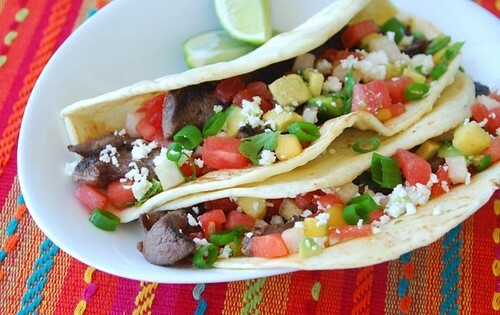 Place the sliced steak on the tortilla shell, spoon some salsa on top, and sprinkle with cheese. Serve immediately. Note: Cotija Anejo is a mild flavored Mexican cheese with a crumbly texture and can be found in the refrigerator section of most major supermarkets. I love watermelon with savory contrasts, too. There is a wonderful recipe in Julia Child's Cooking with Master Chefs for a fruit salad of watermelon and canteloupe, I think, with a spicy Thai peanut dressing. Delicious! Your salsa looks amazing; I will have to try it this weekend! We must be on the same wavelength, because I made a cucumber and raspberry salad tonight that used many of the same flavors. (One of the recipes I'm working on for July: Month of the Cucumber). Beautiful pictures with your post, too! i love watermelon! I love mangoes!!! oh to mention love jicama.. yummmmmmmmmmm! This is very creative Susan. I could never have imagined anything but Watermelon and Halloumi. However, in Greece they make the most amazing spoon sweet with the peel of the watermelon (of course after peeling the green part). BTW voting has started for the Fat Chefs or Skinny Gourmets? and you can vote for your favourite recipe and your friends can vote for you. Perfect for the summer! What a delicious, refreshing and colorful dish! You always have great ideas! Beautiful colors - looks like fireworks! That salsa looks great Susan!!! lydia-What a coincidence. I just made a watermelon and cantaloupe salad but with Italian flavors. haleysuzanne-Month of the cucumber? I didn't know that. And it's so refreshing in salsas. urkuletz-Yay! So glad you like it. ivy-I've never tried it with halloumi. Now I'll have to, thanks! ann-It is wonderful with feta and olives. I never would have thought to include watermelon in a salsa (or anything outside of dessert, to be honest), but this looks too good to pass up (not to mention how festive it looks). I definitely have to try this one out. I don't think I've ever had watermelon in a savory dish -- what have I been doing all my life?? This looks so, so good. This is such a good post! Wow, thanks for all the great ideas. I think I may shift my focus this 4th of July and go with your steak tacos and salsa. My mouth is watering looking at that bowl of fresh ingredients. Wow, that would also be good on grilled salmon. Or, even scattered on fresh lettuce leaves. Or, fish tacos. I could go on with this one. Very nice! Thanks! Great post! I am a fellow SD food blogger. Gonna definitely try your watermelon jicama salad. I make a watermelon, cucumber balsamic basil salad I need to get around to posting.But yours is looking pretty good. Oh that picture has my mouth watering! Mmmmmmm! Susan, Your salsas are always gorgeous! I love the idea of a fruit salsa with steak. This is so easily gluten-free. Thanks for another a delicious recipe. How can it already be a year since your grilled watermelon post? Oh my, this summer has snuck up on me. Another fabulous watermelon recipe to add to the stash, though . . . thanks! I can't wait to try this. I've never tried Jicama but this seems the perfect recipe to start with. Your salsa looks great! There is a Mediterranean restaurant near my house in Portland, Or. where they serve a similar salad combination. The fruit is cut larger (1" cubes) and add some salt cured olives and feta crumbles. Susan I was just thinking about what I could make with the watermelon I bought. I can always count on you for something out of the ordinary and delicious. It looks great! Those tacos look good! Nice and bright and colourful. I think that watermelon are really great in salsas like you made and wonderful in salads too. This looks fantastic and delicious! Great way of using watermelon! I know that in Israel it is often served with feta cheees but I've never tried that. Yumm I love watermelon salads. I'm going to give this one a try! This watermelon salsa has my mouth watering Susan. Great contrasting flavours for the tacos. i never knew that watermelon was associated with July 4 th ! And also u have used them in so many savoury dishes. Nice .... i even have one lying in the kitchen. I'm making the salsa today for sure. Thanks ! I love tacos but never thought of adding watermelon. My kids LOVE watermelon. Great idea! Now if I put watermelon in the tacos I won't have to urge the kids to eat them. Thanks. love it! i have trouble eating fruits other than fresh berries during the summer, but i can learn to make room for watermelon too. that grilled watermelon recipe sounds amazing too! This is genius, I love it. I never thought about watermelon in there. How perfect. I don't think I've ever had watermelon in a savory dish. This sounds fantastic! This is beautiful! I never thought to use watermelon... I can't wait to try this!! I was scared to come by coz I knew I'd bookmark like mad...just what I'm doing! This sounds great Susan...I'm gonna make this soon! YUM!! You do come up with some lovely salsas! I'd like to try it with halloumi cheese.Yum! Right on watermelon!! 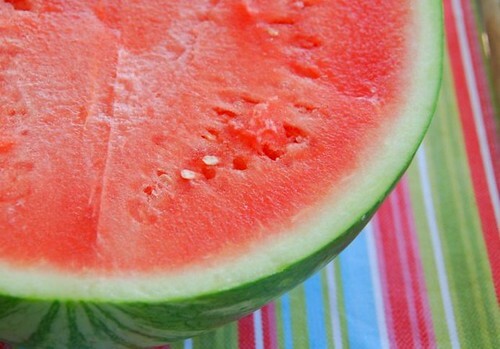 I often have watermelon for a glass of water;) so much nicer! My aunt & I used to have the seed spitting contest all summer. Watermelon, jicama and mango that sounds terrific indeed. We just finished eating one of the best watermelons I've ever had and now I wish I had saved some to make your salsa. Will definitely buy another and do just that. Just fantastic Susan. You now have 2 recipes in my fave recipes of 2008 so far - I am going to have to make the difficult decision of using just one when I announce them at Xmas time! Looking forward to making this with Cerys soon. What a beautiful salsa! I love how the colors just pop. Those tacos would make any summer evening something special. Adding watermelon to the salsa is brilliant.. You always come up wih amazing ideas!! I love watermelon ..and the first pic is too too good!! Those tacos are too beautiful for words. Love the summer colors! I'm obsessed with watermelon, and have been loving all of the creative uses for it I've been seeing recently. I must say though, this salsa and the grilled watermelon really take the cake! Wonderful! This look heavenly! I will have to try this soon - we buy a lot of watermelon here. I guessed 38 lbs.... Ooops. Have a happy 4th! If that doesn't sell itself on its looks, you might like to know that there are reports over here is that watermelon can work as well as Viagra. Honest. Fantastic! Love your combination of flavors. The cotija cheese is a brilliant addition. Happy Fourth of July to you and your family Susan! Some people must only be getting about 10 pounds because I know I eat more than my share! At least I did before I went on the South Beach diet! Hope you had a nice holiday. That's a beautiful salsa, and I love the way you've styled it. Susan, when I am still dreaming about your strawberry-n-pork and kumquat-n-watercress, you've already put watermelon in salsa! You are the driving force of new cuisine! Have a wonderful summer Susan! I'm going away for vacation, will "see" you soon! 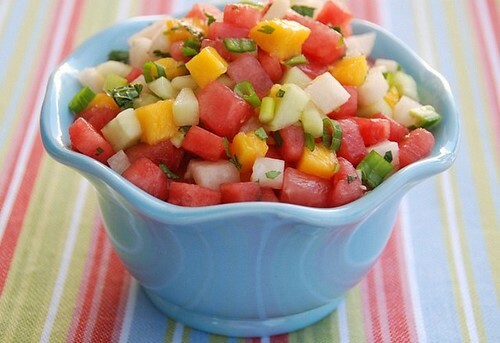 I love the colours in this salsa - so pretty and I love the idea of grilled watermelon too. You may now feel sorry for me... No watermelon! None. Rien. Nada. But I shall feel happy for you! all the things i love: watermelon, mango and jicama...this is magical susan!! i love it! Susan, thins sounds simply refreshing and perfect for the summer. i love mixing watermelon with savory foods. as a matter of fact i get funnly looks when i sprinkle watermelon with fresh cracked pepper!! let's not forget the classic watermelon stonehenge! great idea! i just saw a chef on TV make a curry w/ watermelon - so creative. it's one of those underutilized fruits! great job! I think I'm in love with your salsa... The colours, the flavours, the textures - the whole lot! I think hubby is going to have to fire up the grill this weekend... I also found another novel use for watermelon this week - use it instead of strawberries in a Pimms cocktail. Too delicious.